From opening new doors in the understanding of gas flow in low permeability shale packages to reservoir monitoring and enhanced recovery, nanotechnology’s potential is huge. 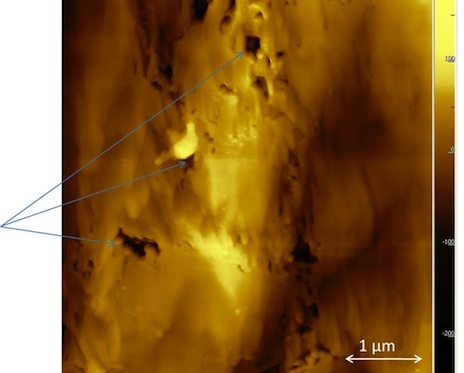 A topography image taken by an atomic force microscope (AFM) showing nanopores in a shale sample. The entire image is approximately five micrometers across or about 1/10th of a human hair diameter. Source: Dr. Javadpour Something that we are all familiar with, a human hair, is about 50,000 nanometers (nm) in diameter. Over 1,000 times smaller than the human hair, nanoscale materials occur naturally in the environment. Now, scientists and engineers are arranging collections of tens to thousands of atoms to create nanoparticles that can range from 1 to 100 nm in diameter. The important point here is that these nanoparticles can be built to specific sizes and for specific purposes as well as be assembled to perform specific functions. Simply put, nanotechnology is the engineering of functional systems at the molecular scale. One of the exciting and challenging aspects of nanoscale particles is that the behavior can be very different from classical physics, following the much more different rules of quantum mechanics. For example, you cannot walk up to a wall and be teleported to the other side, but, at the nanoscale an electron can. Insulators (substances that cannot conduct an electric charge) can become semiconductors when reduced to the nanoscale. Thermal conductivity and other physical properties can change drastically at the nanoscale. With particle attributes changing at the nanoscale, scientists are experimenting to learn more about their properties and ways to take advantage of them in various applications. We already use many products that employ nanotechnology such as nanoparticles of zinc oxide or titanium oxide in our sunscreens or as a coating on clothing for better UV protection, in scratch-resistant coatings on our cars and eyeglass lenses, and in making tennis rackets lighter and stronger. The oil and gas industry is also embracing this new and exciting technology. Nanoparticles and nanopore spaces are just too small to see even with the best optical microscopes. Scanning electron microscopes (SEM) can obtain two-dimensional topography and mineralogy images on finished surfaces. However, rocks contain many discontinuities and their properties can be heterogeneous, even at nanoscale. Atomic force microscopy (AFM) is a unique tool for nanoscale characterization because it can provide high-resolution topography images that show both mechanical and physicochemical properties. AFM uses a stylus tip to scan a sample in a way resembling our sense of touch which allows direct measurement of interactive forces between surfaces or molecules. AFM can measure the topography of surfaces for an examination of the geometry of the pore network at the nanoscale. Direct measurement of surface forces, such as van der Waals, and electrostatic forces between molecules of interest and mineral rocks are also possible with this instrument. Hardly a day goes by without news of a shale gas or shale oil play discovery. New drilling and fraccing technology has helped unlock these resources, but what we lack is an understanding of where all these resources are coming from. The mudrocks are composed of very fine grain particles with very small pores, so the traditional Darcy permeability equation cannot explain or describe fluid flow from such small pores. For the first time, technology is now imaging these tiny pores and enabling researchers to unlock some of their secrets. Along with all the new shale plays, oil companies are trying to squeeze every drop out of the conventional reservoir that they can. The latest secondary and tertiary recovery methods, drilling muds, and ways of connecting pore space over great distances are yielding good results. Nanotechnology is playing a key role and will be ever-present in the future oil or gas field. Dr. Javadpour is the principal investigator on a project examining particle transport in porous media, one of many projects supported by 10 major international oil companies through the Advanced Energy Consortium (AEC). The AEC was the brainchild of Dr. Scott Tinker, Texas State Geologist and Director of the Bureau of Economic Geology at the University of Texas at Austin (see GeoProfile, pages 48-50), and opened in January 2008 with Dr. Tinker serving as Director. Natural fractures in rocks cause drilling mud losses and wellbore stability problems. A recently developed "double porosity model" can make drilling safer and less expensive.